This diagram covers nearly a billion light years of space. Don’t forget where we parked. So, let me back up a sec. The address locations I mention above are obvious enough up to the solar system. The Sun is located in what’s called the Orion arm in our spiral-armed Milky Way galaxy, which itself is part of a collection of a few dozen galaxies called the Local Group (we’re the biggest, along with the Andromeda galaxy). This ragtag group is on the outskirts of much bigger cluster of galaxies, called the Virgo Cluster, which has more than 1,000 galaxies in it and is several million light years across. That in turn is part of an even more ridiculously huge structure called the Virgo Supercluster, which contains several clusters (including, perhaps confusingly, the Virgo Cluster; these get their names from their locations in the sky). Superclusters are among the largest scale structure in the Universe, spanning over a hundred million light years. Mapping our local supercluster is rather difficult. First, it doesn’t really have a defined edge like a solid planet; it just kinda fades out with distance, until the next supercluster comes along. Also, you need to get the three dimensional location of the galaxies around us, which also presents difficulties. However, work done by a team led by astronomer Brent Tully has done just that. The team used radio telescopes to observe thousands of galaxies in the local Universe. As the Universe itself expands, it carries these galaxies away from us, and their radio waves (as well as all light they emit) loses energy—this is very similar to the more familiar Doppler shift. Astronomers call this loss of energy “redshift,” and the farther away a galaxy is, the higher the redshift is. But if galaxies are clumped together closely in space they’ll orbit each other, or at least their mutual gravity will affect their motion. This in turn affects the redshift for each galaxy on top of the cosmic expansion. We know pretty well how the Universe is expanding on local scales, so if you subtract that part away, what’s left is the local motion of the galaxies. That can be used to map how gravity of other nearby galaxies is affecting them. This let them make a map of the density and movement of galaxies in space. That, finally, means they could map where all these galaxies are in the Universe. 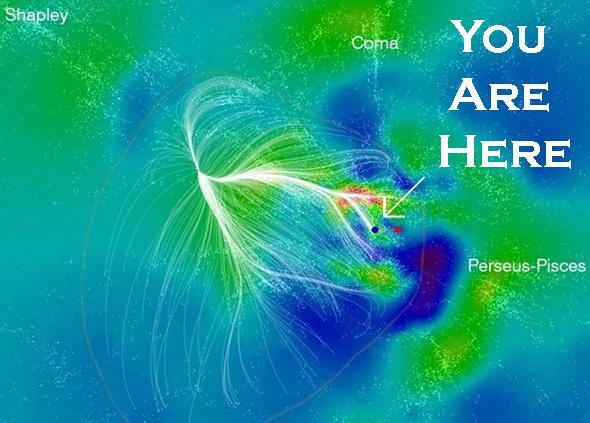 They found that the Virgo Supercluster, our old home, is actually part of a bigger structure they named Laniakea, which apparently is Hawaiian for “immense heaven.” No arguments here! * Laniakea is about 500 million light years across, a staggering size, and contains the mass of 100 quadrillion Suns—100 million billion times the mass of our star. That’s a lot of mass. Your local supercluster. Each white dot is a galaxy; red regions have lots of galaxies, dark blue regions are voids with few. 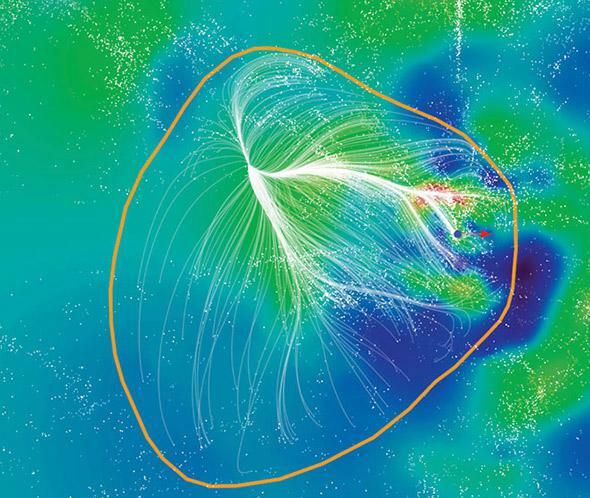 The white lines represent flow streams, along which galaxies are moving toward the center of mass of Laniakea. The blue dot to the right is our location, near the edge of the supercluster. Illustration by SDvision interactive visualization software by DP at CEA/Saclay, France. The border of Laniakea isn’t well-defined, but the astronomers decided how to get a sense of it: its gravity. Put a galaxy near Laniakea; if it falls toward the supercluster then it’s inside the border; if it falls away toward some other supercluster than it’s outside. As definitions go it’s not so bad. It’s not the be-all-end-all; as another astronomer points out in the Nature news article, it doesn’t tell you what the eventual fate of the supercluster is (which depends on its mass and size). Like most definitions, it depends on the question you’re trying to answer. In this case, it’s more of a guideline than a definition, and I’m OK with that. Astronomy is both ennobling and humbling. It tells us our place in the Universe, which can make you feel small … but don’t forget that we’re a part of that Universe, and the fact that we can figure this stuff out at all makes us very big indeed. *I’ve also seen it translated as “immeasurable heaven” which means more or less the same thing colloquially, but also has an ironic ring to it, given that measuring it is exactly what we’re doing.